My friend Jan recently dragged me to a knitting class. Of course, I knew that we'd need to buy yarn and needles (I do work for Interweave, after all! ), but I was suprised to learn that we needed more than two needles, plus a stitch holder and darning needle. (And a crochet hook for those klutzy types who kept dropping their stitches . . . ahem.) It was a bit of a shock to get my credit card bill and realize just how expensive those mittens were, especially since I wasn't sure how much knitting I'd be doing in my future. How exactly does this relate to beading? Just as with any new craft form, the cost of tools and supplies can be a bit daunting, especially if you're not even sure about your choice. Maybe you want to try metalsmithing or loomwork or soldering or lampworking, but you aren't sure if you'd even like it. I completely understand this hesitation–I have quite a collection of abandoned passions gathering dust in my basement, including a pasta machine (for polymer clay) and a beautiful set of metal stamps. I'm beginning to think that he who hestitates isn't lost, he just has more room in his basement! That "do I really need another tool?" hesitation is the reason I loved this beginning metalsmithing project by a well-respected jewelry designer, Tim Creight. Most experts assume that you've already made the decision to embrace this new technique and advise you accordingly. In Step by Step Jewelry Workshop, for example, author Nicola Hurst lists 26 tools as "essential." Step by Step Jewelry Workshop is a beautiful book full of step-by-step photographs–perfect for someone who knows she wants to learn the basics of soldering, metalwork, and wirework. (If that's you, you might as well buy it now!) But what if you just think you might like metalsmithing, but you're not sure? If you're hesitating about working with metal, this project from Jewelry Artist is for you. It's designed to use familiar tools–things you can buy inexpensively at the hardware store if you don't already own them. Plus, Tim gives you lots of alternatives. For example, he suggests that you hammer on a "hard, stable surface." Sure, an anvil would be ideal, but if you don't have one, don't sweat it. Jewelers use various files to smooth rough edges, but Tim suggests that an emery board used for manicures will do in a pinch. Of course, if you fall in love with metalsmithing, you'll want to buy proper tools and learn to use them correctly, but first things first. Try some simple metalwork–you might like it! And if you don't? Well, there's always right-angle weave or stringing or metal clay or wirewrapping or bead embroidery or . . . This beginning cold metalsmithing project from Jewelry Artist has been designed to use extremely simple tools that can be made from hardware store items. 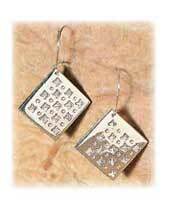 If you're interested in a more sophisticated metal earring project, check out the DVD workshop on Riveted Earrings. Tracy Stanley shows you how to cut and texture metal sheet, shape and wrap wire, and add rivets to your pieces. View a video preview and purchase a copy. 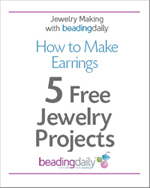 This free earrings ebook, Making Jewelry with Beading Daily: How to Make Earrings: Five Free Jewelry Projects, includes five earring patterns that use a range of techniques (simple stringing, wirework, simple metalwork, seed bead netting and fringe) and a variety of materials (silver, copper, seed beads, crystals, pearls, gemstones). Both beginners and more experienced jewelry makers will find at least one beaded earring design that will inspire them to catch the handmade earring craze! Michelle Mach shares free projects every Friday on Beading Daily. If you have comments or questions for Michelle, please post them on the website.